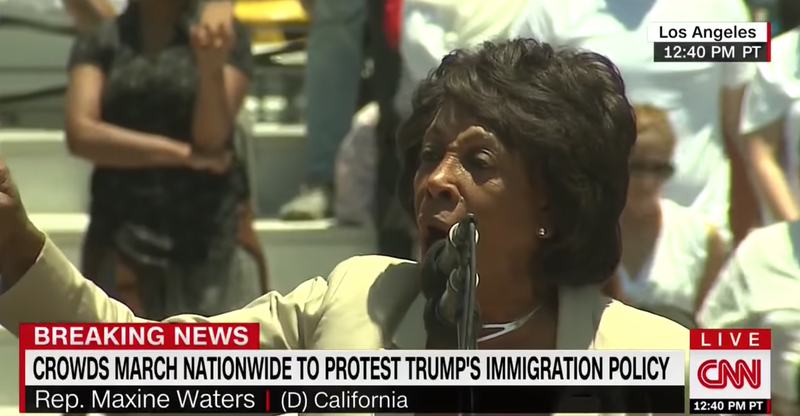 Maxine Waters addressed death threats during a rousing speech at the ‘Families Belong Together’ rally in Los Angeles, Calif., on June 30, 2018. Congresswoman Maxine Waters did not mince words on Saturday as she addressed the death threats she’s received since calling on Americans to harass Trump administration officials. “If you shoot at me, you better shoot straight. There’s nothing like a wounded animal,” Waters told the crowd at a Los Angeles “Families Belong Together” rally. The demonstration was part of nationwide protest against Donald Trump’s immigration policies. As USA Today reports, Waters received death threats this past week after she encouraged citizens to confront members of Trump’s administration whenever possible. The threats forced her to cancel events in Alabama and Texas this weekend. Waters was responding to recent, high-profile confrontations between members of the public and Trump officials. Earlier this month, Department of Homeland Security Secretary Kirstjen Nielsen was forced to leave a Mexican restaurant in D.C. after protesters showed up. And in Virginia, the owner of Red Hen in Lexington refused to serve Press Secretary Sarah Huckabee Sanders because of her role in the administration. “Let’s make sure we show up wherever we have to show up. And if you see anybody from that Cabinet in a restaurant, in a department store, at a gasoline station, you get out and you create a crowd. And you push back on them. And you tell them they’re not welcome anymore, anywhere. We’ve got to get the children connected to their parents,” the California Democrat said at another Los Angeles rally last week. Trump—never one to pass up a chance to bully a black woman—drew attention to Waters’ remarks on his Twitter account. “Congresswoman Maxine Waters, an extraordinarily low IQ person, has become, together with Nancy Pelosi, the Face of the Democrat Party,” wrote Trump Wednesday afternoon, adding a veiled threat towards Waters. As Waters underscored the urgency of reuniting more than 2,000 migrant children forcibly separated from their families at the U.S.-Mexico border, she made clear she wasn’t going anywhere.